Orthopedic apparatuses and mechanical devices used in diseases and injuries of the locomotor apparatus for treatment, and also for the prevention of contractures and deformities. Orthopedic devices play the role of a temporary or permanent dentures functional purpose; they provide the fixation of the affected part of the body, unloading, correction of deformation, the training bodies of the movement to restore function. For the manufacture of orthopedic devices use leather, wood, metal, plastic, rubber, fabric, liquid glass and other materials. Manufacture of orthopedic devices always imprint (plaster model), which is removed from the patient at the maximum possible correction of deformation and functionally advantageous position of the affected part of the body. Main components of orthopedic apparatus: sleeves, tires, plates, hinges (artificial joints) with locks and a lockless, springs, screws. Depending on the destination orthopedic devices are divided into fixing, unloading, corrective and functional. Fig. 1. Splint for fixation of the elbow joint. Fig. 2. Splint on the lower limb. Fig. 3. Articulated fixing device. Fig. 5. The castle (a) and lockless (b) vehicles with a belt on the lower limb. Fig. 6. 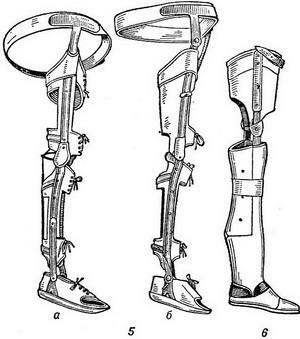 The device with a wooden case of the lower leg (prosthesis) when LLD. Fig. 7. Women's fixation-disposable corset for lumbar spine. Fig. 8. Male fixation-reklamirui (corrective) corset for the lumbar spine. Fig. 9. Functionally-corrective corset with growdigital used scoliosis vermehrung and cervical spine. Fixing orthopedic devices are often tire cigarette-making structures. Produce them in a splint (solid liners without hinges), articulated the limb segments (Fig. 1) or all of a limb (Fig. 2), a hard corset any of shells connected by a hinge (Fig. 3). The purpose of these prosthetic devices - completely immobilize the limb (part of the body) or partial limitation of movement in the joint. Disposable orthopedic devices - corsets - promote the transfer of support of the affected Department on the next, more on bony prominences (Fig. 4). Corrective orthopedic devices provide correction of deformities. In most cases produce orthopedic devices mixed designs intended simultaneously to commit, and for unloading (figure. 5, 7, 8, 9). When LLD over 12 cm apply functional and anatomical cosmetic orthopedic apparatus (Fig. 6). Lately create a functional orthopedic devices to restore muscle function through the use of external energy sources by converting currents, augmented with special equipment. Appoint orthopedic devices as possible after the correction of the form, the provisions of the affected part of the body of any of orthopedic treatment. With flaccid paralysis in the acute period of polio prevention of contractures use splints. In the recovery period when residual effects of polio appoint the locking devices with locks that secure the limb in a physiologically advantageous position when walking; when opening the lock patient can sit down, bending limb. Lockless orthopedic devices are functional; they help to restore force of muscles in more than orthopedic devices other structures, providing movement paralyzed limbs. Orthopedic devices appoint and with flaccid paralysis of traumatic origin, as well as in spastic paralysis. For contractures, the depositions of the functions of the separate muscle groups used devices with locks fitted with elastic rods, springs, hinges with metered volume movements. During slow healing of fractures and false joints, systemic lesions of the skeleton, chronic inflammatory diseases of musculoskeletal apparatus used fixation-unloading orthopedic devices. If resultante joints of upper limbs, paralysis in order to hold hands in the correct position, as well as for prevention and treatment of contractures use prosthetic devices of upper and lower extremities. 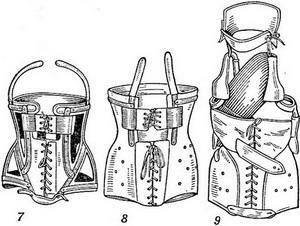 Corsets are intended for fixing, unloading or correction of the deformity of the spine. Depending on the level of damage to the spine distinguish corsets for the lumbar spine, lower-, medium-, verkhnegnutov and cervical. Corrective corsets used more often when kyphoscoliosis, and only in children and adolescents; the fixation handling corsets shown in the spondylitis. Orthopedic devices must put on clothes (t-shirts, stockings). During the day, the patient must be in a corset or prosthetic device, removing them only while medical gymnastics, massage, physiotherapeutic procedures. On the night of orthopedic devices and corsets recommended to be removed completely, or replace plaster cots / Cribs, Longuet, tyres. 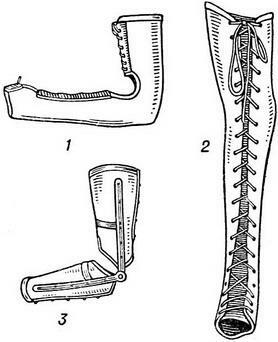 Breakdown corset or orthopedic apparatus should seek prosthetic workshop will perform the necessary repair or remove bushel for the manufacture of a new product. Orthopedic apparatuses and mechanical devices, which are used when lesions limbs or spine to commit, unloading, for therapeutic purposes, and to prevent contractures and deformities. To appoint distinguished locking, unloading, reduction and replacement O. A. Fixing O. A. are used for immobilization of joints of limbs and spine; they are used for removing of movements in razboltannym joints and non-consolidation of fractures. Disposable O. A. nominated for the liberation of the affected joints from the load while walking and standing. Reducing O. A. pressure or traction restore the normal shape of the limbs or trunk. Replacement O. a., equipped with elastic rods, used to replace function paralyzed muscles. Orthopedic devices should be simple design that makes it easy to put on and take off the device, just-fit, strong, easy. For manufacturing O. A. apply skin (Russia leather, saddlery tore), which strengthen the metal the tires (hence the name "bus cigarette-making" O. A.). The skin can be replaced or cloth impregnated with glue, gelatinous, emulation or plastics - vinyl plastic or polyethylene. O. A. produce strictly individually on plaster models, in rare cases, Ovcharka without imprint. To obtain the plaster model of the affected part of the body or a limb smeared with vaseline. Leg, or the trunk) give the correct position. In the middle part of the body or limbs pave the lace and on top of it, put a plaster bandages in 2-3 layers. To obtain an imprint (negative) should carefully model the iliac crests bones, sciatic thigh, knee, ankle, foot arch, and all roughnesses of a limb and bony prominences (see Plaster technique). Without giving the impression is completely dry, it cut the cord with a knife (Fig. 1) or special plaster scissors, cut the cast is possible without prior laying lace; in these cases, the incision should be on the middle line of the cast. Edge of the cut cast of carefully folded and shoot it from the limbs or trunk, then edging closer, fixing a few turns of the bandage. For more accurate mapping of edges in the mould before cutting cross put a pencil few strokes. Cast dried, and then the inside is filled with gypsum slurry. After hardening of gypsum negative delete and get positive, exactly reproduces the shape of the torso and limbs. For the preparation of positive manufacturing O. A. in places bony prominence (pelvic combs, ankles, Misaki), in order to avoid further pressure on them O. a., add a layer of gypsum slurry, and where necessary to achieve a tight fit of the liner system, remove the plaster with positive. Then on the positive plan of location of tyres, joints, plates for bus connections. The location of the hinges must match the hip, knee, ankle joints. To produce positive adjustment spike and then produce leather sleeve. For preservation of mobility in joints are used hinges, allowing movement in the same plane (single-axis). To limit the amount of motion in the joints establish locks - one-way or two-way. The device is assembled try on a sick and only after that definitively finish. Among the locking devices are most common braces and splints. Corsets are designed to limit movement in the spine. Depending on the level of destruction corsets produce different height: diseases of the lumbar spine to the shoulder blades, diseases of the breast and cervical with growdigital (Fig. 2). There are corsets hard, semi-hard, soft, elastic. In hard corsets both symmetric half rigidly connected to each other. Stiff corsets (plaster, nitrovarnish) appoint a tuberculosis of the spine with great destruction of the vertebrae or other diseases that cause this deformation; semi-rigid, no rigid connection symmetrical halves of the corset, - bus-leather (Fig. 3), tire-fabric of Gassing - at the diseases proceeding with a small fracture vertebrae; soft-flexible - fabric with plates from flexible steel or plastic - in deforming scoliosis. Tutorials are intended for immobilization of the joints and fixing limbs; they are produced without hinges. For immobilization of the hip joint using a splint, consisting of poluchalsya and sleeves thigh, still sealed with a metal tyres (Fig. 4). Children who have had polio, for the prevention of contractures appoint splint at night; these splints produce lightweight, without metal tyres. A typical example of the tire cigarette-making machine that has the hinges on the level of the joints, is O. a., consisting of sockets thigh and lower leg and Shoe on the foot. To prevent slipping apparatus with limbs sleeve thigh leather or metal Vetluga attached to a leather belt, and in cases of severe damages of the hip joint to poluchalsya. In diseases of the knee joint is used tire cigarette-making machine, consisting of sockets thighs, legs and slipper on foot; in diseases of the ankle - out liner lower leg and Shoe. To facilitate weight O. a., especially the children, in the absence of pronounced limb deformation appoint skeletron apparatus in which the liner replaced by manzhetok. 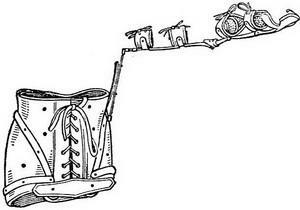 In the absence of deformity apply lighter units, connected by a hinge, with normal shoes. These devices are made on Ovcharka. When poliomyelitis consequences appoint lockless apparatus of SNIIP - with biaxial knee joints (5, 1) and machines with uniaxial hinge (Fig. 5,2), as well as the castle, which is collected from the standard tyre, under the scheme of CNIIP. Fixation device for the upper limb consists of socket arm and forearm; in diseases of the shoulder joint, the shoulder sleeve connect with the girdle or adjustably through the hinge, or still a metallic splint. In the elbow joint use locking, locking the elbow joint in the most functionally advantageous position (angle 85 degrees). Disposable O. A. are built so that the unloading is carried out at the expense of the seat attached to the top liners and hip to the side tire, with length 1 to 2 cm longer than the length of the leg. At the moment of support in this O. A. the entire burden falls on the area of the buttock and crotch and legs freely slack (Fig. 6). In reducing O. A. corrective action is carried out by means of pressing of Pilotov or springs, such as corrective corset in case of scoliosis. In this corset scoliotic distortion is corrected by stretching along the longitudinal axis and pressure pelota on the area of the costal humpback (Fig. 1.1 and 2). When stoop apply spidergate different designs. Replacement O. A. used, for example, when the defects of the limbs. To restore the lost functions at palsy of the muscles in O. A. do elastic tie rod (Fig. 8). Fig. 1. Cutting plaster casts the string. Fig. 2. Bus-leather corset with growdigital. Fig. 3. Semi-rigid skeleton.avandia tire-leather corset. Fig. 4. Tutorials: 1 - for elbow: 2 - for the hip joint; 3 - for ankle joint; 4 - for the knee joint. Fig. 5. Lockless units under the scheme of CNIIP: 1 - with biaxial hinge; 2 - with a single axle hinge. Fig. 7. Corset of blunt: 1 - front view 2 rear view. Fig. 8. The office holding paralyzed the extensor fingers.